I have been playing with Star Trail processing for quite a while. Ever since I wrote the StarCircleAcademy Stacking Action I’ve been tweaking processing to try different things. Sometimes failure is inevitable, sometimes… well, you’ll see. First, you may want to look back through my earlier columns on shooting and processing star trails because this is not a primer on star trails – it builds on what I’ve previously written and this is not a good place to try to understand what stacking is. Second, please understand that I use a variety of tools but almost all of my more successful endeavors end up as layers that are combined in Photoshop (CS5 at the moment). You could combine your layers in GIMP if you don’t have Photoshop, but you’ll be out of luck if you try to use Lightroom. Smoothee – Averaged sky and/or foreground to reduce the grittiness that sometimes results from brighten stacks. I’ve been espousing this for quite a while. See the Simple Astrophotography Processing Technique. Blobulous – stars at the beginning (or end) of a trail are made to stand out from the rest of the trail. Comets – star trails appear to grow brighter and the end of the trail looks like the nucleus of a comet. 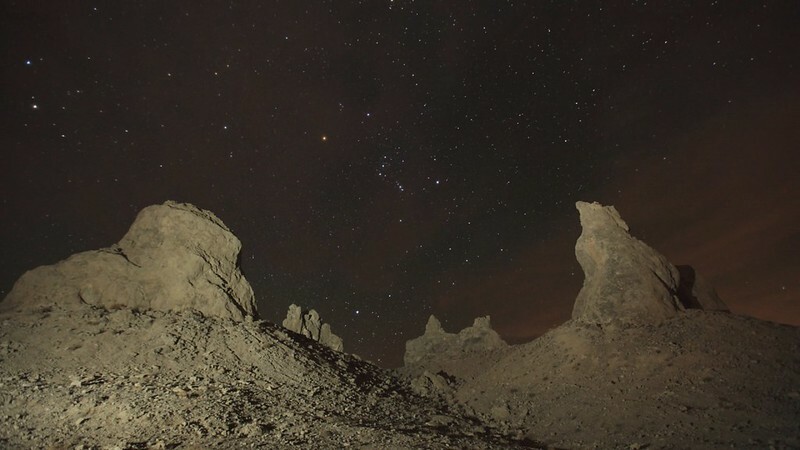 Blackened – A clever trick removes sky glow from light pollution, the moon, or twilight. And of course you can make “Blobulous Comets” and “Blobulous Streakers” and “Blackened Smoothee Comets” and more. To creatively combine exposures, I usually create the following stacked frames. Contrast is reduced, smoothness increased. Hot pixels become really bright. Allows some increase in brightness but more smoothness, too. Experiment with different divisors. Normally I create all of these combinations using Image Stacker against my JPG files because it is really easy to do. I end up with a set of frames something like these although I’ve significantly brightened them so that they are easier to see. In a Nutshell: Combine the Average stack over the Brighten stack using Normal mode at 45% opacity. I’ll start with the Smoothee technique since it’s probably the easiest to do and perhaps the easiest to understand. The problem with “Brightness” (or lighten as it’s called in Photoshop) is that it will also pick up all the hot pixels, and the brightest bits of noise. Averaging on the other hand tends to smooth out everything except for truly hot pixels since most noise is random. By putting an averaged stack as a layer over the brighten stack and then adjusting the blending modes and opacity you get a smoother sky and foreground. Exactly what settings to use depend on the images, but surprisingly many of the blending modes for the Average layer work here including Darken, Multiply, Overlay, and Normal. The starting place for Opacity is about 45%. Hint: You can also use an Additive stack instead of the average stack but usually only the Normal blend mode will work. For even more fun combine the Additive stack and the Average stack. For additional smoothness you can also subtract the “Darken Stack” while adjusting the opacity to prevent halos and weirdness. In a Nutshell: Add one of the single frames more than once. There are two ways to produce “Blobs”. 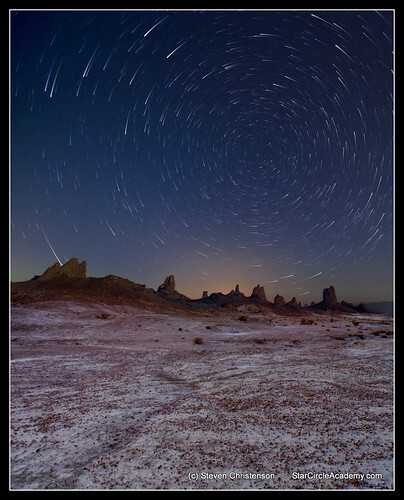 One way is to add “Comets” to a smoothed star trail. The other is to simply pick an image (usually the last one in the set) and add it in using “Add” or “Screen” mode. To make the blob more pronounced duplicate the last frame so it’s added twice. BUT remember when you add in any single image the hot pixels are going to come out… and even more so if you add an image twice. These two techniques require some fancy stacking techniques. Fortunately I’ve created an action to do all the fancy stuff. I’ll be rolling out the action and the explanation to my Photo Manipulation Webinar participants first <NOTE: The Advanced Stacker PLUS action has been released and is available for purchase in our store>. I know you’re going to ask so let me save you some typing. Except for the “Comet” image above, all images used in these illustrations were taken during the Ancient Bristlecone Pine Workshop in the Patriarch Grove on White Mountain, East of Bishop, California. The 34 or so images that I’ve combined in the examples above were all taken with the following settings: Canon 50D, ISO 400, f/3.5, 79 seconds, 10-22mm lens at 15mm. This entry was posted in Composites, Creativity, Hot or Dead Pixels, Noise Reduction, Photo Tip, Photoshop, Stacking and tagged additive stack, average, average stack, blending, brightness, combining, foreground, layering, layers, lighten, lighten stack, masking, noise reduction, Photoshop, smoothee, smoothness, stacking, Star Trails, stars, StarStax on October 11, 2012 by Steven Christenson.